So the blonde #5 won the vote, but then they decided to change her hair color to red? Crak is excited. wasn't her hair red in ME1 and 2 ? Dunno. I customized my FemShep in M1. She was asian. I could be wrong, but I think this is the first time a Femme is being 'officially' used to market the game. It is. It's (partially) due to an article a feminist game journalist wrote for GameInformer a few months ago. Even though she got a lot of backlash from the female gaming population for basically making female gamers look like idiots, it scared BioWare (or EA) enough to answer the call. Hopefully the increased attention on FemShep will improve her character in the game. I'd love to play as FemShep in ME3. Jennifer Hale (Voice of Fem Shep) discusses ME3. Good reminder, I have a pre-order for the CE on hold. 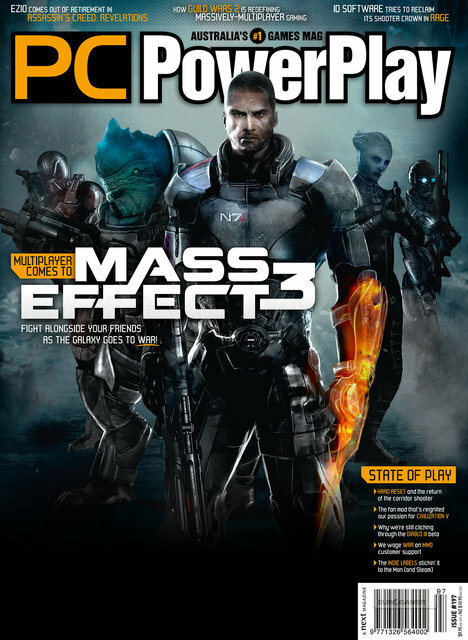 If you're more interested in the take of a local publication, [Official Xbox Magazine] is also promoting an upcoming issue that features details about Mass Effect 3's online multiplayer. So after numerous indications that it's coming, it seems safe to classify this particular aspect of the game as "confirmed." BioWare's Casey Hudson has chimed in on [Twitter], adding that the multiplayer will be cooperative, not competitive. He wrote, "Yes, co-op MP missions for #ME3: they're real, and they're spectacular. Rest assured it's nothing of what you've feared. More soon..."
Oh dear!! let's hold the jury! I had hoped the delay would let Bioware make ME3 stunning beyond belief, after EA pushed them on DA2 and it struggled. First Kinect and now co-op , thumbs and fingers crossed they remember to make the game first this time! I reckon it'll be scripted if anything, it would be too hard for 4 players to have an input in conversation and consequence, hence the non Sheppard play. Looks kinda interesting and dare I say fun, but the singleplayer is still top priority. After all that's where the immersion lies. In most of it's mechanics Mass Effect broken down is not actually that amazing, however the characters/story/universe and writing are top dog. Very hard to pull that off in a mp environment,who gets to decide what/where/why for your mp crew, if ya know what I mean.